Last edited by 75Fan on Sat Feb 09, 2019 11:09 am, edited 3 times in total. Here's my prediction for this game….. Adjusting for location leaves a final predicted outcome of 91 - 54 in favor of Murray State! Did you know that Tyresse Williford is averaging 14.7 points per game on the season, yet the last time we faced SIUe, he dropped 33 points on us? That performance is still his career high. Did you know that SIUe has played in 5 games that went into overtime? (most in the nation!). They have played a total of 8 overtime periods in those 5 games (also, most in the nation!). Did you know that SIUe has scored 50 or more points in one regulation half three times this season? Did you know that SIUe came from 16 points behind to beat Morehead State? It is the third time this season they've overcome a double-digit deficit. Did you know that SIUe leads the Ohio Valley Conference in Offensive Rebounds per game by pulling down 12.5 per game? Did you know that SIUe has only beaten the Racers 3 times in 22 tries? They've only won 1 time at Murray State - an 83-81 victory in 1975 at Racer Arena. They have never won at the CFSB Center. Did you know that Ja Morant has 14 double-doubles in 22 games this season? He has been featured on ESPN's Sports Center Top-10 Plays 4 times this season. He is on pace to become the 1st player since Assists are recorded to Average 20 points and 10 Assists in a season. He only needs 27 more assists to break the all-time Ohio Valley Conference record for assists in a season - set by Duane Washington of Middle Tennessee in 1987. I don’t cuss. But, this team makes me want too. We deserve to lose this game by 20. Looks like things turned when Cowart went out. What does Davis and Whitley contribute? Not sure they are even improving. Going to a zone to protect Ja's fouls was an interesting move. Gave up too many offensive rebounds in that stretch and sucked the flow out of the game. Pathetic last 10mins of the 1st half. Careless turnovers and jacking 3's when we don't need them. Get the ball down low and make them foul you. First 10 minutes we actually had ball movement and looked good. Last ten we went back to stand and watch ball. Musta been one hell of a halftime speech. The team that played the second half needs to be on the floor for 40 minutes in Clarksville. Not sure who the imposters were in Racer uniforms the last few minutes of the first half. We gave up a 30-10 run before we scored 2 to end the half. 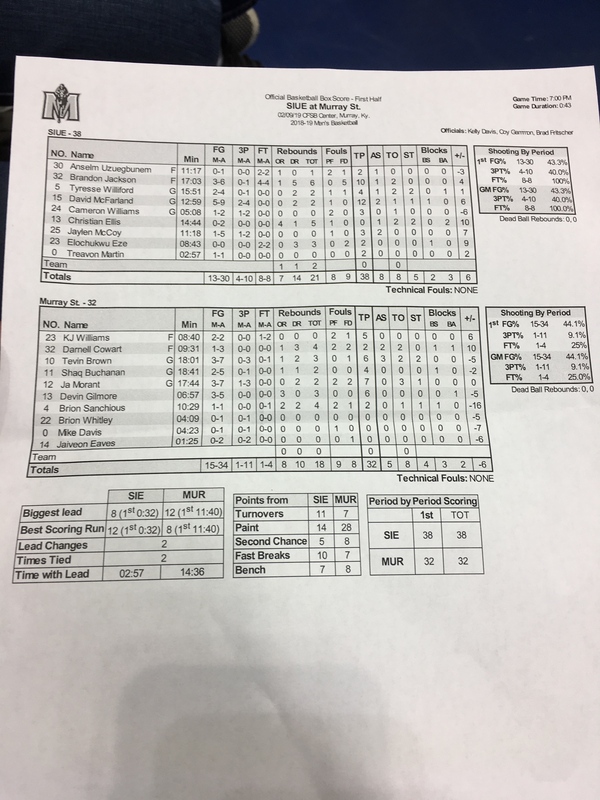 SIUE gave up a 40-8 run starting with that same basket. When the OVC Tournament starts, a run like the one in the first half will spell the end of our season. Never thought back in November that our go to line up would include Gilmore and Williams or Cowart on the floor at the same time. That is a pleasant surprise. It seems once we went to the full court press it sped SIUE up and that played right in to us getting out in the open court and that is Murray basketball. We are just god awful in the halfcourt still. I'm nominating big Nell to play point guard next year after those moves tonight. Onr thing about this team you just don't know what to expect next be it good or bad. What is up with the flashing lights up in the rafters? Anyone else notice this?